This past Columbus Day proposed a serious dilemma for me: what to do with myself? I had the day off from work! On a suggestion from our friend Steve (you may want to follow him on Twitter, he’s very entertaining), I was inspired to make it a Brooklyn day and explore a bunch of different areas, starting with the Brooklyn Botanical Gardens in Prospect Park. I had never visited the Botanical Gardens and I really enjoyed it. Columbus Day gifted me with some wonderful weather, and I was able to stroll amongst the flowers, trees and buzzing bees… until I got hungry. Which, as you may know by now, happens with alarming frequency. The next dilemma was: where to lunch? 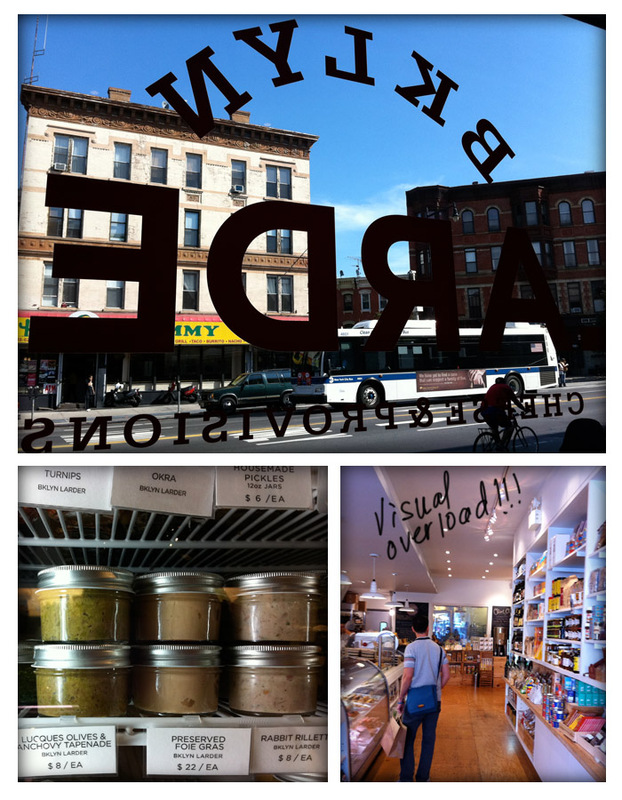 I checked my trusty phone and realized that somewhere else I had never before visited was nearby: the Brooklyn Larder. So I departed the park and headed onto Flatbush Avenue in search of it. I would have stopped at Franny’s and enchant you all with more pizza tales of finely baked crusts and tomatoes, but – alas – they were unfortunately closed. However, Brooklyn Larder did not disappoint. First, a confession: as a graphic designer, I occasionally experience visual overload. It’s a good thing. It happens when I walk into a place (could be a shop, a museum, a nice street or a gourmet food market) and there is just SO MUCH to look at. So many cool things. So nicely designed. It’s like frolicking in a daisy field or something. For my brain. Anyway, that’s what this place was like for me. I literally had to hold myself back from buying everything. 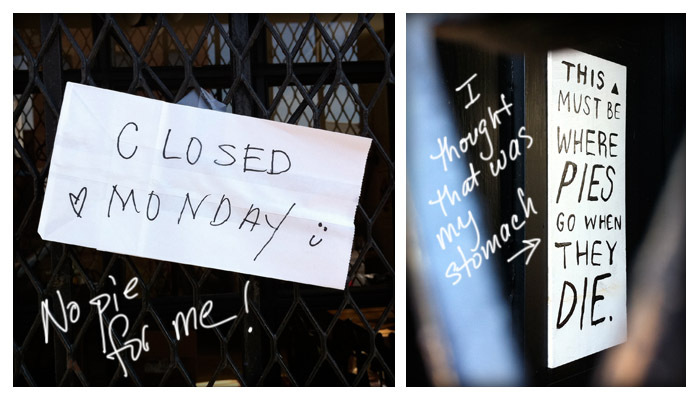 Instead, I took a deep breath and ordered lunch. Lunch was perfection. Truly. The sandwich bread was fresh and nicely toasted – crispy on the outside (and still warm) and chewy on the inside with just the right amount of sandwich filling. The cheese and olives paired wonderfully, neither overpowering the other. As for my cookie, well I was a fan. It had REAL chunks of ginger in it! I expressed my enthusiasm about this to the friendly girl behind the counter (in much the same way as I expressed my enthusiasm for fried pickles at Joe Doe). Her look was appreciative, but also seemed to suggest, “Well, of course. Why wouldn’t there be?” Fair point, fair point. This seems to be the mantra and general offering of the market: fresh ingredients – either served or packaged (their range of perishable packaged foods like cheese, meats, and duck liver is extensive). They get all their food items that aren’t baked or made on the premises (many of them are) from places close-at-hand. 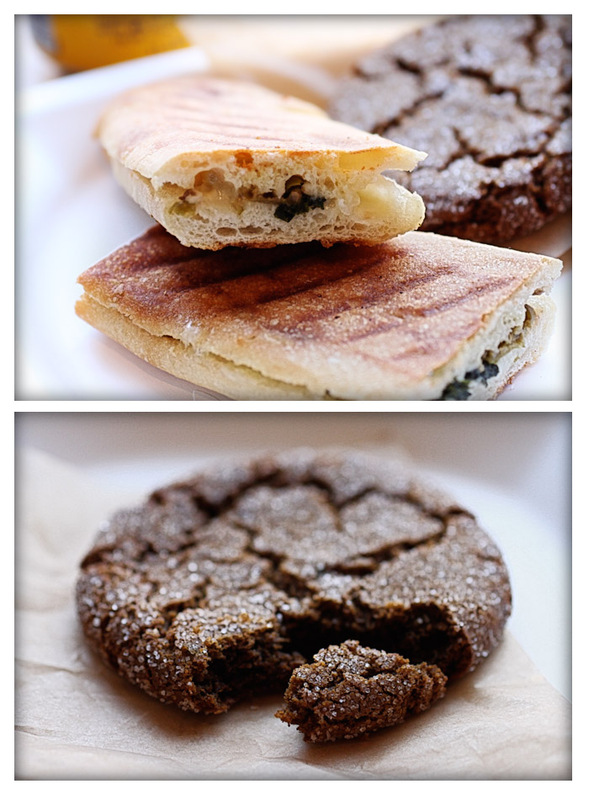 In fact, you can read more about the cookie-baking process and the master mind behind it here. Before I left I bought a few more things: a huge loaf of sourdough bread from Scratchbread, and a little package of Apple Cider Caramels from Liddabit Sweets which I will talk about later. After this, I decided to venture out in search of pie. I had been hearing about Four and Twenty Blackbirds Bakery for a while and wanted to go find it. This bakery also gets excellent reviews, but unfortunately for me was closed on that particular day. Oh well. So onward I walked to Park Slope! Where I discovered that there is an Almondine Bakery! Yes, folks, I do live in a hole. However, the sight of this bakery prompted me to walk to DUMBO (I got some good exercise that day) and go to the Almondine Bakery there. So I did. 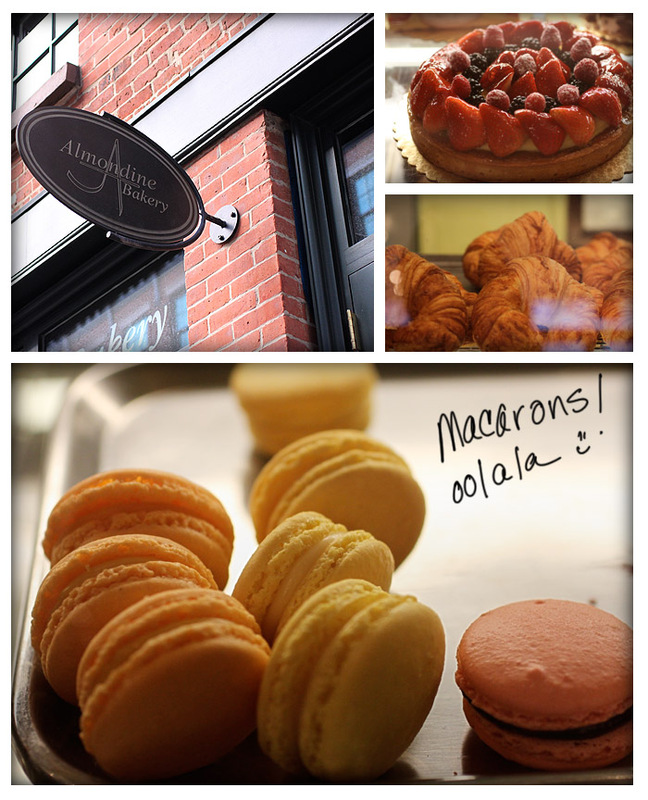 I first heard about Almondine when I was researching French macarons in New York. I was obsessed with this little cookie. Not the coconut variety called “macaroons“, but a little, flavored sandwich cookie made with meringue and a filling of choice. Almondine’s macarons are very good. I’m not an expert on these little cookies, but I do like the following features: 1. a meringue cookie that has a delicate (breakable) outer crust that yields nicely to a much softer and flavorful interior, and 2. A filling that actually tastes like the advertised flavor. Almondine achieves both. They also have a nice line-up of other pastries, croissants and tarts. Then, it was back on the subway to the ‘Boken to examine my purchased treats from Brooklyn Larder. First, was this gargantuan loaf of sourdough bread from Scratchbread. I decided to make dinner out of this beauty. So I cut it into thick slices, fired up the broiler and melted some Gruyere cheese on those bad boys. The bread was delicious. The crust is especially thick and flavorful, while the inside is chewey and nicely textured. 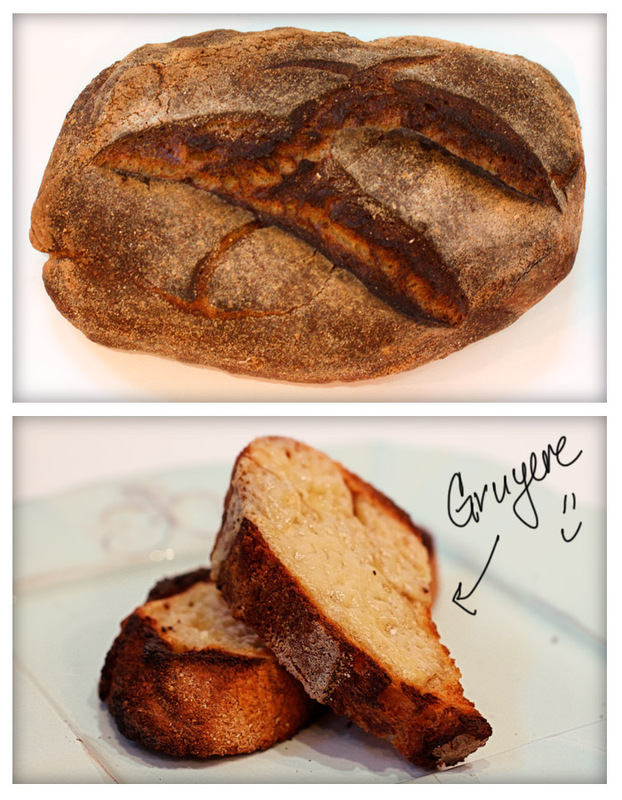 The “sour” part of the sourdough is pronounced, which I like. It is a statement bread. I just made that up, but I think it fits. I definitely liked it, and have been eating it for breakfast (toasted with honey) and lunch (toasted with hummus and roasted tomatoes) too. That about wraps it up for my day in BK (I have rhymed TWICE in this post. Can you find them both? GO!). I leave you with a few random images in parting, and I would also encourage you to head over the bridge (if you are not already over there) and visit all the aforementioned establishments. Bring me back some cookies.